For over four decades, the World Series of Poker brand has brought poker players a quality live gaming experience each and every year in the state of Nevada. Having launched WSOP.com for informational purposes years ago, the site is now primarily used to advertise their online poker site, which was officially launched in 2013. The site currently offers some of the best cash games, sit and go’s and tournaments anywhere in the states of Nevada and New Jersey. Owned by Caesars Interactive Entertainment, WSOP.com is licensed and regulated in both states, offering anyone who is located within the borders the chance to compete. The Department of Justice’s reinterpretation of the 1961 Wire Act gave states the power to legalize online gambling in their jurisdiction, provided it was voted on properly and passed by the state government. 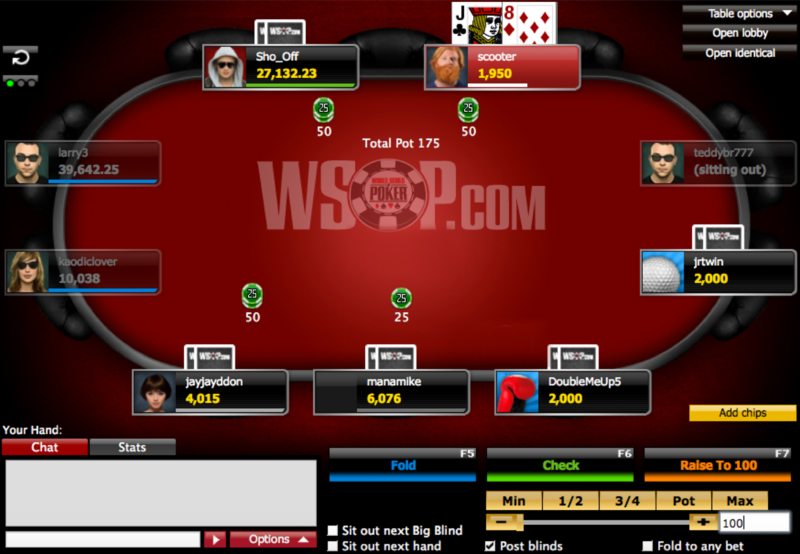 In both Nevada and New Jersey, players are allowed to participate in all of WSOP.com’s poker games as long as they are located within the borders of either state. This site is the most popular choice for poker players and has continued to grow in the years since the WSOP.com brand launched their poker room online. Tons of active promos, bonuses and freerolls for players in NJ and NV. FREE $10 just for registering a new account. Top of the line mobile software for your smartphone and tablet. Real money poker traffic is limited to only NV and NJ, with the state of Delaware sharing their player pool with WSOP.com Nevada ONLY. There are two promotions currently running at WSOP.com which will allow you to pad your bankroll. First up is the 100% first deposit bonus worth up to $400. On top of that, you can take part in freerolls for new members to get a feel for tournament game play at absolutely no cost to you. 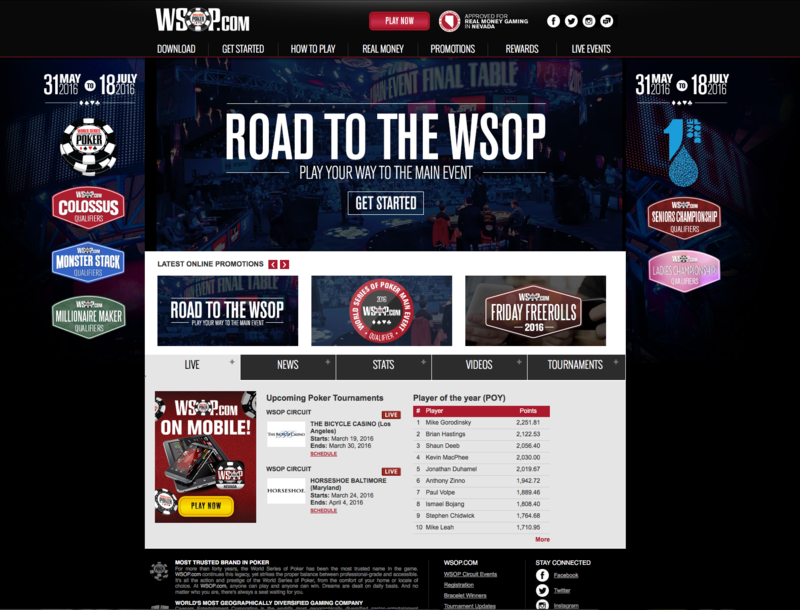 Promotions are constantly added to the WSOP website, including a free $10 just for registering an account. When you create a new player account at WSOP.com, you can earn a nice first time deposit bonus as you deposit funds into your account. Put as much as $400 into your account and earn the exact amount back in bonus cash thanks to the 100% match bonus. To clear the bonus, you will need to earn Action Player Points which are given during real money game play. The first $10 in bonus cash will be released in $1 increments for every 10 APPs you earn. The next $40 will be released in $5 increments for every 50 APPs earned. The final amount will be released in $10 increments for every 100 APPs earned. Along with the generous first time deposit bonus, players in Nevada and New Jersey can take advantage of the Daily ‘Welcome Week’ Freerolls. You will be given seven free tickets to take part in the daily $100 Welcome Week Freeroll tournaments. Play as many days as you like during the first week of signing up for WSOP.com to win cash prizes. The tournaments begin at 7 pm each day and provide players with 2,000 in chips. The top 20% of the playing field will earn a cash prize. As a member of WSOP.com, you will be able to take part in the rewards program known as the Action Club. With the Action Club, you will be rewarded for every raked hand you play at the site. You will earn points and rewards based on your monthly level which is determined by the number of Action Points you earn. To earn APPs, you must take part in real money cash gaming and tournaments. You will earn 2 APPs for every $1 in rake collected during ring games. You will earn 2 APPs for every $1 in tournament fees paid. Once you begin real money game play, you begin to earn points. Start with Copper level and work your way up to earn even more rewards. Once you reach the Silver level, you will be able to convert APP’s to WSOP points, which gives you access to cash rewards. 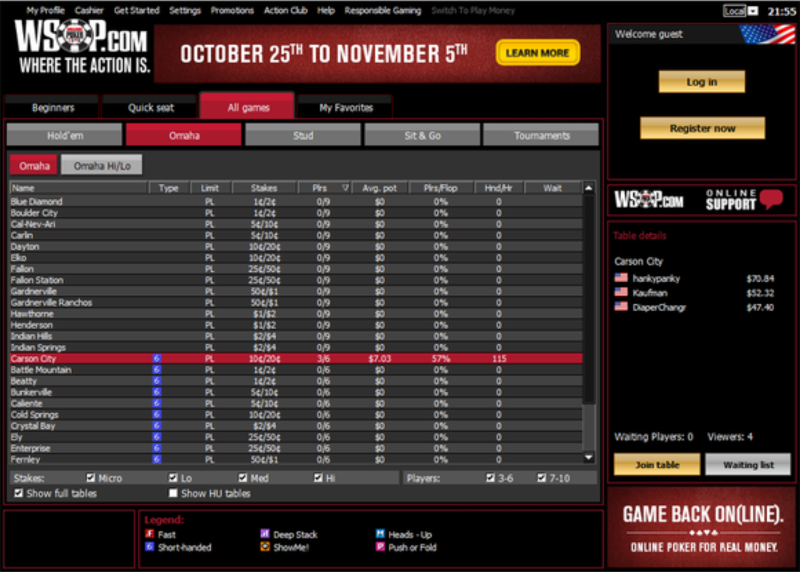 The gaming software of WSOP.com is downloadable to your computer or mobile device and only available in real money provided you reside within the borders of Nevada or New Jersey. However, if you want to play for play money then you can also download the free WSOP.com app in the App Store or in the Android Marketplace and play anytime. Both states use software provided by 888. The WSOP.com New Jersey software is only offered New Jersey residents while the WSOP.com Nevada software can be used by residents of Delaware since the two decided to start sharing player pools in 2015. Once you have downloaded the gaming software, you will have access to the easily navigable WSOP.com lobby, where you can instantly view and filter out ring game tables, MTT’s and SnG’s. You can choose the All Games tab to have access to every game offered on the site based on format and buy-in. Choose to resize open tables with the resize feature, with a minimum size of 500×365 pixels offered. The maximum will be what the screen resolution allows on your computer. You have the option to view as many as nine full table screens at once with table tiling, with the tables adjusted to the 500×365 pixel size. Use the ‘Settings’ area in the lobby to customize your experience with options for graphics, alerts, sounds and more. You can choose from one of three table themes for the look you want during play disable animations and add in other features to your liking. HUD use is not prohibited with the WSOP.com sites, with the state of Nevada not allowing HUDS altogether. When Nevada legalized and regulated online poker gaming, they specifically stated no 3rd party software would be allowed for data tracking as it gave players an unfair advantage. While you can enjoy your WSOP gaming via PC or Mac, you also have the option to download an application for Android or iOS device. WSOP has provided applications where players can access their site via most smartphones and tablets. Currently, there are five game types offered at the WSOP: Texas Hold’em, Omaha, Seven Card Stud, RAZZ and Lowball. You will find No Limit and Pot Limit Hold’em, Fixed Limit Hold’em, Fixed Limit Omaha, No Limit and Pot Limit Omaha, plus Fixed Limit 7 Card Stud among the options offered on the site. Texas Hold’em is the most popular with stakes for all games ranging from $0.01/$0.02 to $10/$20 during cash game play. Tournament buy-ins start as low as $1.10, making game play affordable for everyone. Sit & Go game play is mixed with options for full ring format, six-max and heads-up. You will be competing at one table during SNGs. Heads up SNGs offer NLHE while Six Max format are popular with Omaha Hi/Lo and Pot Limit Omaha formats. Sit and Go players also can compete for cash prizes with their monthly SnG Leaderboard. There are several tournament options offered at WSOP.com, in New Jersey and Nevada. Take part in dozens of daily tournaments, with the majority offered in NLHE format. The majority also have a guaranteed prize pools in the 4 and 5-figure range, along with satellites to help send you certain events at the World Series of Poker. Traffic numbers varying based on each state, with New Jersey seemingly being higher in numbers than Nevada. However, traffic booms once the World Series of Poker starts, as most players opt to play online poker once they’ve flown into Nevada to take in the tournament ambiance at the Rio. Overall, the brand tends to see around 400 to 500 cash game players during the peak times on weekdays, which isn’t half bad considering the site was struggling to sign up players for months after they opened and went live. Both the New Jersey version and Nevada sites offer the same options when it comes to deposit and withdrawals. Because the sites are based in the US, many financial institutions did not want to become involved with transactions. The sites only offer a few choices when it comes to banking methods. To be able to make a withdrawal at WSOP.com, you must provide the site with a copy of identification. A driver’s license, national ID or passport can be used. A bank statement may be needed depending on which withdrawal method you choose. Neteller can be used for withdrawal, being the quickest option, taking around 3 days to clear. A bank transfer can be used, taking around 5 days or less to clear. A bank draft takes longer at five to eight days clearance while the cash cage at a Caesars venue will issue immediate payment. The Support page of the WSOP.com website allows you to view genres that you may need assistance with in regards to game play, depositing, withdrawals, login, eWSOP.com Poker Review for New Jersey and Nevadatc. You can also contact support via email with [email protected] or telephone at 1-866-745-2385. From 3pm to 11pm PST, you can use the Live Chat feature to speak with a customer service representative. Owner/operator: Caesars Interactive Entertainment, Inc.